Between Camilo Atehortua’s ride and the screening at Kendall, the project has raised over $4,000 for the Wounded Warrior Project. A good day meant 85 to 90 miles on the road — and sometimes he pedaled into the night, guided by a flashlight. He slept on gym floors, in motel rooms without electricity, in a tent in 30-degree weather that had him waking up to near-numb toes and frozen drinking water. He battled all kinds of weather, aggressive drivers, rude authority figures. And in one week, Camilo Atehortua cycled 520 miles from Boston to Washington, D.C., enduring physical and mental trials, and witnessing the beauty and brute power of Mother Nature, and the best and worst of humanity. A native of Colombia and veteran of the Marine Corps who did a seven-month tour in Iraq, Atehortua suffers from the condition, known as PTSD, and has discovered a sort of healing power through cycling. Directed and edited by Roslindale-based Anthony Barounis, and released through his Tonekat Productions, the film had its premiere at the Kendall Square Cinema in Cambridge on Jan. 14, and was also screened at 51 Lincoln in Newton on Feb. 5. All proceeds from both the ride and the documentary – about $3,000 at recent count — are being donated to the Wounded Warrior Project, which helps injured members of the military transition back to civilian life after duty. 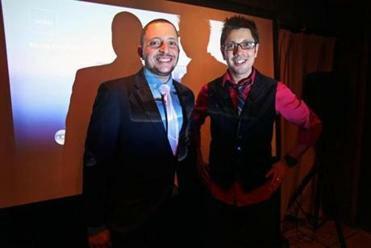 Camilo Atehortua (left), who made the ride to bring attention to PTSD, with filmmaker Anthony Barounis. The hope is to raise more money through future screenings, Barounis explained, and he’s also submitting the movie to various festivals. A lifelong bicyclist who works as a sound engineer, Atehortua embarked on his solo, weeklong odyssey on Nov. 4, shortly after Hurricane Sandy released her fury on the East Coast. His goal was to reach the Iwo Jima Memorial in Washington on Veterans Day. Using a GoPro camera positioned in a shock-proof case on the drop bars of his bike, he captured 60 gigabytes worth of footage. 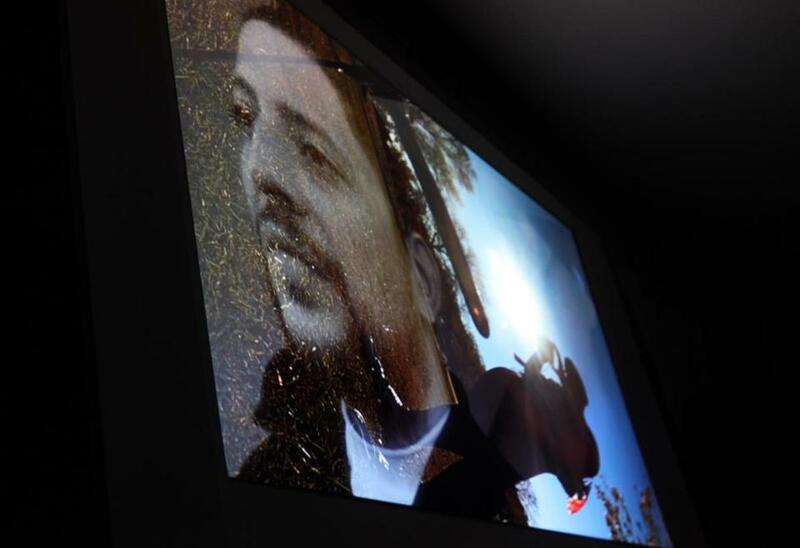 Barounis originally intended for it to be condensed into a short YouTube video, but once he began culling through it, he realized the potential for a much more powerful story. 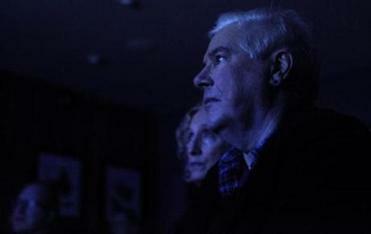 Both stark and artsy, the hour-plus film is set to a soundtrack by the Electrical Fire, Barounis’ electronic music band. As Atehortua whirs along on his bike, the film weaves shots of the road rolling beneath his tires with close-ups of his intense and focused face — he positioned the camera either up or out to capture both — as well as scenery both bucolic and urban, and regular interludes of the rider talking to the camera about his mental state, or the day’s highlights or low points. “It’s starting to wear on me — the miles, every day,” he says during one stop, face bedraggled. A sunny and bright morning cheers his mood. “Time is money, and the sunlight is my ATM,” he says with a smile. Working his way south on his F-Series Felt road bike loaded with a tent, tools and other necessities, he struggled up and down “ruthless” hills in Connecticut, got sidelined by another storm, bedded down one night in a completely empty gym-turned-shelter in New York intended for Hurricane Sandy victims, took advantage of a motel room another night to dry out his soaked clothes and take a rare shower, and visited shops crammed with eclectic gear for cycling. “I tried to pack as light as possible — bare minimum,” he explained as he watched the film from a sofa in Barounis’ Roslindale apartment one recent evening. He relied on a GPS and good-old paper maps for guidance; a steady stream of house, lounge, and jazz music for entertainment. He often donned a shirt declaring “Pain is weakness leaving the body” — a mantra from his days in boot camp — and proudly displayed an American flag on his left shoulder. On active duty with the Marines for four years, Atehortua was deployed to Iraq in September 2006; he worked on security and stabilization, and dealt with the daily threat of roadside bombs. He was a backup on raids, and helped patrol for explosives with metal detectors. Returning home, he dealt with the after-effects, most notably “extreme paranoia” in large groups, as well as the difficult readjustment from a regimented military life to a daily civilian one, and what he described as an oddness of day-to-day freedom. 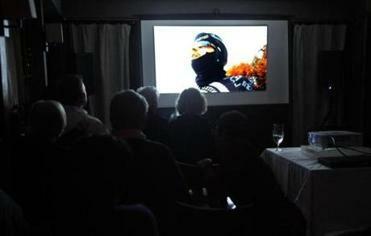 A scene from “Ride Crazy: The Single Man March’’ during its screening at the 51 Lincoln restaurant in Newton last month. But he has found relief from PTSD on his bike, where he feels more grounded, his senses are heightened, and he can outpace the worry and anxiety. Ultimately, his journey was met with mixed reactions — on the one hand, strangers took him to lunch, or gave him food or money. On the other, he was kicked out of the visitors center at Independence Hall in Philadelphia because he brought his bike inside. In the end, Atehortua said, he doesn’t know whether he was on his bike to find himself, or to do just the opposite — leave all the pressures of daily life behind, and just focus on survival. In either case, it was a “great, eye-opening experience,” he said. He had both good and bad moments, met interesting people who shared their dreams and goals with him, and realized things that people take for granted, but shouldn’t. For information on the film, including future screenings, visit www.ridecrazy.com.